Our new friend Morris Spector from Hamden CT has quite a range of talents — professionally he is a graphic designer, he is an accomplished genealogist (read his account of his roots journey in Poland), and he has a devilish sense of humor. Here he combines those skills by giving Isaac Elchanan Spektor a Photoshopped haircut and beard trim, and then dispensing a Spektor-like Halachic responsa on the question of whether Photoshopping of facial hair is permissible under Jewish law. The bottom line: "Since Moshe Spector didn't use a razor it is definitely permitted." Here is my response to the Photoshop trimming dilemna. Actually, I was removing the beard to see what he looked like sans beard. However, the neat look made him look younger so I stopped with the airbrush. But . . .
My understanding is the prohibition against shaving was something to do with the Egyptians who practiced the clean Savalas image. Also, another reason was you wouldn't risk cutting yourself. To overcome this, there are some of the orthodox community who use some type of powder to defoliate the punim. Here is the "official" opinion. "Ye shall not round the comers of your heads, neither shalt thou mar the comers of thy beard" (Leviticus 19:27) is understood by the talmudic rabbis not to mean that it is wrong for a man to be cleanshaven, but only that facial hair must not be removed with a razor. The standard code of Jewish law, the [16th-century work by Rabbi Yosef Karo,] Shulhan Arukh (Yoreh De'ah, 181:10) rules that it is permitted to remove all facial hair with scissors even when this is done as closely as if with a razor. On the basis of this, many Orthodox Jews shave with an electric razor on the grounds that technically this machine, with its two blades, is not to be treated as a razor. The reason for the prohibition of shaving is not stated in the Bible, but [the 11th-century Spanish/North African sage] Maimonides understands it as a protest against idolatry, conjecturing that the heathen priests shaved their beards. Others have seen it as a means of distinguishing between males and females. Neither of these reasons would explain why the distinction is made between shaving with a razor and by other means, but this distinction still holds as a matter of law, although some later authorities do invoke both reasons not as a matter of law but of piety. Consequently, it has been the practice among many Jews to wear a beard and sidelocks (pe'ot). The Talmud describes the beard as an "adornment of the face" and implies that a beardless man cannot be said to be handsome. In the kabbalah [mysticism], the beard is said to represent on earth the "beard of the Holy Ancient One" on high, that is, the stage in the unfolding of the sefirot [divine emanations] at which the divine grace, symbolized by the strands of the beard, begins to flow throughout all creation. In kabbalistic circles the beard becomes a sacred object and some kabbalists would not even remove a single hair from their beard. The statement that, according to the kabbalah, there is no need to wear a beard outside the Holy Land, is unwarranted. Hasidism follows the kabbalah and all Hasidim wear long beards and sidelocks. Most westernized Jews do not wear beards, including many Orthodox rabbis, who shave with an electric razor but sometimes sport a small goatee beard as a bow in the direction of the tradition. Yet it can be observed that the wearing of a full beard is coming increasingly into fashion among the Orthodox. Reform Jews do not consider the prohibition on shaving with a razor still to be binding. So all that stuff is what Rabbi's argue about. However, I'm certain if I were to ask R. YES for a ruling, he would say: "After careful consideration and a lot of beard stroking here is my ruling." "So Photoshop or Barbershop. That is the question. Since Moshe Spector didn't use a razor it is definitely permitted. That's my carved in stone haluchic ruling. Furthermore, I order you to lay this meshugas to rest and keep your eye on the ball. The suspense in unbearable. Anyone for DNA?" Morris Spector and I spoke on the phone again today after he had sent me another important document — six pages of information about the SPEKTOR/RABINOWITZ/ELCHANAN family faxed from Shmuel Elchanan to Morris Spector in 1996. It is in Hebrew, mostly typed but some hand written, so it gets added to the stack of papers that need Hebrew translation — the top of the stack since Shmuel's family knowledge is more complete and reliable than anyone's. Morris is excited because news of our Rabinowitz family has revived a research project that he thought he had taken as far as he could a decade ago. What he didn't understand at the time was the importance of some of the Spektor descendants using the Rabinowitz name. Even savvy David Einseidler doesn't know what to make of it when he writes "Again that name!" after noting Zvi Hirsch and Joseph are both named Rabinowitz instead of Spektor. (I have not yet introduced the Einseidler research, but this is one of the few places the LA genealogy researcher misses the mark. I'll have more on this in the near future. We don't really have an explanation for why some Spektor children and grandchildren became Rabinoviches. Walter says that Shmuel told him it was an accident of the census — that a census taker wrote Rabinovich when told that the children playing outside were sons of the rabbi. By the way Zvi Hirsch and Joseph are close to the same age, even though they are a generation apart, so they might likely be the sons playing outside. I am going to check and see what census was being taken in Grodno guberniya in the late 1850s. Anyway, in our conversation you could almost hear the wheels turning in Morris' head as he tried to place several pieces of dimly remembered Rabinowitz information that he has encountered over recent years. One is that he thinks he was contacted by another Rabinowitz other than us with questions about a connection to Rabbi Spektor. Since he didn't know of Joseph's family at the time, he didn't give the claim credence, but now it is likely that the other Rabinowitz would be family of ours. If this is a descendant of one of Walter Ruby's siblings, then we'll have found a new American second cousin. If it is an Israeli Rabinowitz, then we'll have another third or fourth cousin to visit on an upcoming trip. That assumes that Morris is right and he did receive such a message, and also that he is able to find it. He said he would look for it. The other Rabinowitz thing bothering Morris was something about Tel Aviv cemetery records. I didn't pay too much attention to that when he mentioned it, but a short while later, he followed up with an email containing a most startling revelation. He found a 1929 burial record for Eliyahu Isser Rabinovich, who was born in Kovno in 1859. His father was Rav Chaim Aryeh. In the comments field of the record is written: "From the family of Rabbi Elchanan Spector of Kovno and Rabbi Yosef of Slutzk. Merchant. Came to Israel in 1923." Here is the link to the relevant page in the JewishGen Online Worldwide Burial Registry. So here we have the first indication that Joseph Rabinowitz had a younger brother. There is only one Rav Chaim Aryeh married to the daughter of the Rabbi of Slutsk, so now it could be that there would have been three Rabinowitz boys playing in the yard. Now it may well be that Eliyahu's existence is covered in Shmuel Elchanan's Hebrew document. I hope so. He has already told us about another sibling Bluma Rabinowitz who was a school teacher in Kovno. That he did not also tell Walter about Eliyahu may suggest that he does not know about him. Eliyahu's burial record doesn't mention anything about a wife or children. Hopefully with more searching we will be able to learn more about his life and even turn up living descendants, another possible batch of Israeli third cousins. Much to digest here, but one thing I am thinking is that of all the Spektors and Rabinowitzes who left Kovno before the Holocaust, almost all went to Israel. Only Joseph Rabinowitz that we know of came to America. We would like to learn how and why it was decided by Joseph and his grandfather Isaac Elchanan that he and wife Lena should set sail in 1875 for a new life in New York. While Morris keeps feeding me more information, I am trying to catch up with his earlier fax transmittal of the David Einsiedler papers. These include not just the three installments of the researcher's handwritten reports but also copies from nine source documents that are cited in the research. I've now had a chance to process the information and will do my best to sift out what is new to us. Einsiedler draws on mostly published information. The most well known are the Shimoff biography and Lifshitz's Toldot Yitshak. But there are four or five different biographical encyclopedias that have listings for members of the Spektor/Rabinowitz family. Several are comprehensive works of important rabbis in history. There is one for Lithuanian rabbis only, and another for the rabbis of Novogrodok. David Tidhar's encyclopedia of pioneers of Israel is especially helpful, with three substantial biographies of Spektor descendants in Israel. There is one problem. They are all in Hebrew. I have been able to identify which document is which using Einsiedler's list as an index. With a number of the documents, I have been able to see where words like Spektor and Rabinowitz appear. I was actually pretty pleased with myself that I was able to call on my inferior Hebrew skills to sort through the papers. As far as I know Morris does not have translations for the documents. If not, we should think about economical strategies to get that done. There are probably about 40 pages that we would want to have translated. I just found a Bay Area Hebrew translator listed on Craigslist. She charges $39 a page. I hope we can do better than that. There is one source that is of greatest interest to me — the page from the Novogrodok book with entries for Isaac Elchanan Spektor and his successor Baruch Mordecai Lifshitz. (I don't know the relation, if any, between that Rabbi Lifshitz and Spektor's later secretary and biographer Jacob Halevi Lifshitz.) Anyway, the Spektor entry on that page also mentions Zvi Hirsch Rabinowitz. 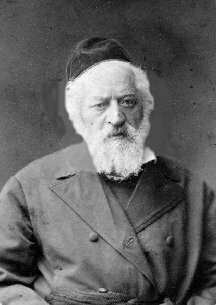 Zvi was born the year Spektor took up the rabbinical post in Novogrodok. Perhaps we can find a way to get this one page translated as a way to get the ball rolling on the whole set. In addition to the Einsiedler collection, there is another important Hebrew document in our collection, Shmuel Elchanan's compilation of his family information that he sent to Morris Spektor in 1996. While I am unable to decipher most of it, it appears that it is the source of all of the detail information for the descendants of Benyamin Spektor that is in Morris' Spektor descendant chart. Surely I will want to get a full translation, but for now I will assume that the key information in it has been reflected in that chart. Actually, as a further reality check, I have an annotated version of the Morris descendant chart that was marked up by Shmuel Elchanan. This mainly corrects spellings in the English translation of names and places that Morris must have rendered from the original Hebrew. Since there is a lot to write about the Einseidler papers, I will continue in the next post.